If so much turmoil and instability was brewing beneath the surface of Ancient Roman society even before Augustus declared a new imperial order, how did the empire survive for centuries before finally succumbing to outside invaders? This somewhat puzzling paradox lies at the heart of the practice of "bread and circuses." 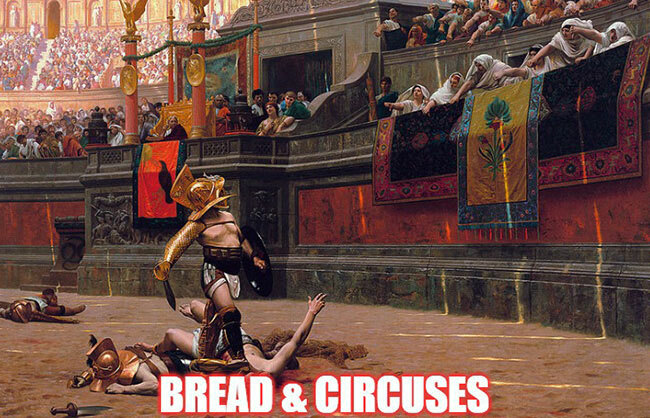 "Bread and circuses" is a famous reference to the way the Roman elite could pacify and distract the masses through cheap food and diversions ("panem et circenses," meaning "bread and games" or "circuses" in Latin). The phrase is originally attributed to the Ancient Roman poet and satirist Juvenal (Decimus Junius Juvenalis), who lived from about 55 CE to 127 CE. Juvenal declared in one of his satires, "The people that once bestowed commands, consulships, legions, and all else, now concerns itself no more, and longs eagerly for just two things—bread and circuses!" We'll explore what he meant by this criticism, the pitfalls associated with relying on "bread and circuses," and how the same characterization has increasingly come to define American culture, as well. One of the primary types of "circuses" that Juvenal was referring to were the spectacles performed at the Roman Colosseum. In addition to the display (and hunting) of exotic animals, this unmistakable structure hosted other events, such as dramas, races, and gladiator battles. All of these were put on at the cost of the state. The Colosseum, whose widely recognized ruins still sit at the center of the modern city of Rome, was absolutely massive. It had a capacity to pack in some 80,000 spectators at a time. Because it was constructed by the emperors Vespasian and Titus (of the Flavian dynasty), it is officially known as the Flavian Amphitheater. It was not the only building of its kind within the empire, but it remains the largest amphitheater in the world. Gladiator games were fought for hundreds of years, perhaps as long as a millennium. The Romans borrowed the sport from the Campanians, and it is believed that gladiators originally fought as a part of funeral rites. The sport peaked during the early period of the Roman Empire. There is a misconception that all gladiators were condemned criminals, but there were many volunteers—even women. The most popular gladiators acquired celebrity status while most were despised by "fans," a phenomenon that has clear echoes to our present day. However, it is estimated that somewhere between 10% and 20% of the bouts ended in death for one of the fighters. Albeit in softer forms, we see the same sort of barbarity showing up more and more in the entertainment of the contemporary United States. From violent video games to reality television, the cruder edges of our popular culture are perpetuating the type of voyeurism embodied by the gladiator games. We have become a society obsessed with celebrity and diversion—not to mention the incredible proliferation of entertainment in general. Though the typical American worker doesn't spend half of their time on vacation like their Ancient Roman counterpart, he or she does consume entertainment during about half of their waking hours, whether it is spent watching professional (and college!) football, a series on Netflix, or a singing competition. We are surrounded by 24-hour networks on TV (like ESPN and E!) because there is always news in the world of entertainment. The first part of "bread and games," of course, is the bread. Ancient Rome oversaw a large supply of grain which was used to feed its population. The grain dole, known as annonae, was maintained for much of the republic and empire. Oftentimes, the Roman state provided the wheat from the annonae to its poorest citizens at reduced or heavily subsidized prices. This list of welfare recipients sometimes swelled to as many as 200,000 individuals. As is often the case, the promising of free grain to the public was introduced with good intentions but later came to be used as a political tool. Populist politicians in Ancient Rome would quickly resort to invoking the annonae as a favorite policy, promising to expand it (or at least not eliminate it) if elected. The practice of politicizing the grain dole somewhat mirrors contemporary attempts by U.S. political parties to win votes through the promise of "goodies" or other entitlements. In fact, this principle even operates in the negative: politicians today often demonize their opponents for not focusing on such "bennies," or benefits. One politician will claim that his opponent wants to eliminate tax breaks; another politician warns that her opponent will cut Medicaid. What type of benefit a citizen values most can tell you a great deal about which party they vote for. Moreover, the abuse of the grain dole contributed (along with military adventurism) to the stretching of Roman resources too thin. In the same sense, the unmanageable level of U.S. spending and debt is threatening to exhaust our own economy. The larger a single polity becomes, the more difficult it is to provide for and keep orderly. There are over 300 million Americans alive today, spread across an entire continent—and, like Rome, all around the world. If the cost to the empire becomes too great, benefits and doles are the first government expenses to go by the wayside. The main thrust of Juvenal's quote about bread and circuses is that the Roman public no longer cared about its civic duties; cheap food and mindless entertainment were enough for them. This is one of the great lessons that the Romans failed to learn. Under a bread-and-circuses regime, the public also grows more dependent on its leaders for everything. Not only is this an unfortunate circumstance to begin with, but it has the effect of increasing political polarization. People are more rigid and myopic in their politics when they're not engaged, making blind partisanship much more likely. Like a chain reaction, apathy and political polarization contribute to the erosion of democratic norms. Near the end of the republican period, politics mattered more to most Romans than their country did. This allows political factions to ignore certain norms or precedents because each side has fundamentally lost respect for the other. 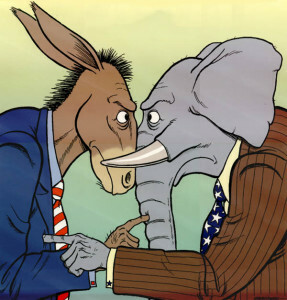 Some degree of human decency is also lost in the process of political polarization. Concomitant with the demise of democratic norms is the rise of authoritarianism. This was clearly seen in Ancient Rome, and is becoming an alarming trend in the contemporary U.S. Amid extreme polarization, lack of public trust, and dysfunctional government, even strong institutions can be usurped. For instance, the judicial system is vulnerable to losing independence to the executive branch when democratic norms are no longer observed. Even if the American Empire lives on, this is literally how republics die. We may not witness the real-life version of the Star Wars scene where Senator Palpatine declares that the Republic is now a Galactic Empire, but this is where the path is pointing toward all the same. "One thing all of this makes clear is that the sickness of American politics didn't begin with Donald Trump, any more than the sickness of the Roman Republic began with Caesar. The erosion of democratic foundations has been underway for decades, and there's no guarantee that we will ever be able to recover. 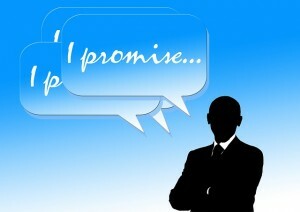 "But if there is any hope of redemption, it will have to begin with a clear recognition of how bad things are. American democracy is very much on the edge." The lack of interest in democracy and capitalism in favor of entertainment and "free stuff" is one of the clear conditions of a bread-and-circuses society. It's much easier for a society to be destroyed, whether from the inside or from the outside, when the people aren't paying attention. Like the 1960s, political culture across the Western world is particularly toxic right now. Unless more Americans become engaged with and aware of the political process, this problem will only get worse. Will the United States change course and avoid the same fate as the Roman Empire? There is that awful saying about history tending to repeat itself—but only if we allow it to. Evan Andrews, "10 Things You May Not Know About Roman Gladiators." History. 4 Mar 2014. William Astore, "Bread and Circuses in Rome and America." Huffington Post. 10 Aug 2013. Alice Schroeder, "The Danger of Living On Bread and Circuses." Bloomberg View. 1 June 2011.